When you hear the word “carport” it might lead you to believe that our fantastic covers are made only for cars. Oh, contraire! 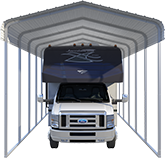 Our carports are unbelievably versatile—giving you the chance to design the ideal space to meet your needs. Avoid the spring rains and the sweltering summer sun with a cool, shaded, covered patio. With a covered patio you will be able to enjoy your outdoor patio space year-round. Are you dreaming of lazy Sunday afternoons spent sipping lemonade? How about a covered deck that allows you complete view of your property 365 days a year? A VersaTube carport is just what you need. Creating an outdoor pavilion or break room for your employees is a trend that’s making waves across the country. Employers such as Google, Walmart and Microsoft have tapped into the benefits that outdoor breaks have on employee productivity. For tips on how to build your own outdoor break room with a VersaTube structure, check out: Create an Outdoor Break Room for Your Employees. Like the outdoor employee break room, outdoor office space can afford incredible benefits as well. By installing outlets and USB port charging stations, you can easily create a personal home office or employee outdoor office area with a VersaTube carport. You and your employees can get the benefits of your home or company’s green space. In turn, the fresh air and Vitamin D can fuel productivity. 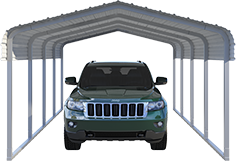 One thing we all know—a VersaTube carport creates a fantastic shelter. If you have open kennels, livestock, or outdoor animals that need covering, a VersaTube carport is just what you need. Use our online structure designer to create a custom size. Or, check out our carport, loafing shed, single slope shelter, and barn structures. Your animals will be safe and sheltered. Have you always dreamed of an outdoor kitchen and dining area? Our covered carports make great spaces for outdoor grilling, cooking, and dining. Gather your loved ones for a family dinner in your new space with a carport from VersaTube. 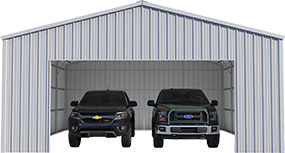 Browse our array of carport options for your next project. Whether you need a special covering to protect your car, boat, trailer, or farm equipment, OR you’re ready to build one of these alternatives, VersaTube has the perfect option for you. Contact one of our exceptional engineers at 888-217-0891 to see how a VersaTube carport can enhance any project you can dream of.